Tickets are available for Toni’s Kitchen’s annual fundraiser on March 31 from 6:00 p.m. – 9:00 p.m., at Halcyon Restaurant, 114 Walnut Street, in Montclair. 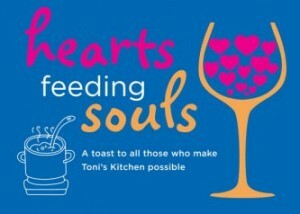 Our theme is “Hearts Feeding Souls.” The original date was postponed due to a snowstorm.The evening will represent a toast to all those who make Toni’s Kitchen possible. We will have music by Shades of Blue, wine, great food and a silent auction. Tickets are $75 each and can be purchased by clicking here. For more information on Toni’s Kitchen, contact Director of Outreach, Anne Mernin, at mernin@slechurch.org.